Kirby Arrow and her best friend Clancy are the only two seventeen-year-olds in a town where everyone knows everyone. They're opposites and want different things out of life; Clancy wants to go to the city and pursue his musical theatre dreams and Kirby is content living with her mother and grandfather who has dementia and help out in their goat's-milk soap business. Kirby is an apprentice carpenter, has a pet goat named Stanley, and chooses not to leave home and go to university because she likes being with her family in a small country town. Besides, her family has a history of leaving, and Kirby doesn't wish to continue the pattern. Life becomes more interesting for Kirby and Clancy when the new Indian restaurant opens opposite Clancy's family's Chinese restaurant and they meet Iris. The story touches on so many issues that happen and appeal to teenagers. Kirby ends up looking for her father, falling in love, helps stage a musical, tries to solve the crop circle mystery and confronts a once-in-a-century storm that has devastating effects. Kirby's voice is straight forward and humorous; it's like listening to a friend chat away. She's honest and warm and self deprecating and funny. She's intelligent, mature, caring and loyal. You can't help but love Kirby. Kirby's epic friendship with Clancy and their whip smart and snappy dialogue will have you hooked. This is a story with a whole lot of heart and soul. A feel-good story that captures life in a small Australian country town, family, friendship, kindness, resilience and supporting one another. There's also a great representation of a multi-cultural community, LGBTI issues, first love and country spirit. This book subverts the usual Young Adult fiction tropes. 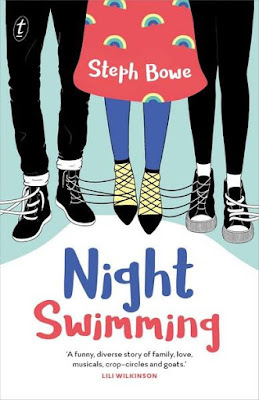 A lovely Aussie YA read.